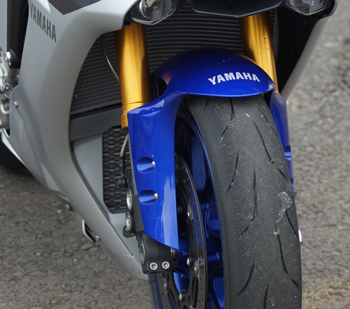 Motorbike tyres are a multi-million pound industry and the reason for that is the research and development that goes into those two rubber circles. As a result there are different types suited to different bikes, different terrains and different weather conditions. For riders, tyres should be one of the most important things you spend your money on, however many riders base their choice of tyre on price and price alone. Here we reveal some of the key facts you should know when buying new tyres. When a motorbike is launched and first released, it comes with Original Equipment (OE) tyres from tyre manufacturers. These are developed and designed in conjunction with bike manufacturers and are specifically tailored to a new bike. Now, these tyres are not just great for your bike, they’re great as a guide for when you need to get a new set of rubbers. Your owners’ manual will not only list the make and model of the OE tyres but it will also state a range of approved alternatives for your bike. This will prevent you slapping off-road tyres on your 125cc commuter. Similarly, go with the tyre that suits your riding. Racing tyres will give you plenty of grip once they’re up to temperature but they take a while to get there. Sports or sports-touring rubbers are better suited to riding all year round. A. You’d look a bit strange wearing two different ones. B. They’d be difficult to walk in, especially if one was a high-heel and the other was a flip flop. The same applies to riding, however there is less emphasis on appearance, as all black rubber looks pretty similar. You should never mix tyre brands – always fit the same make on the front and rear. If you mix radial and crossply tyres, you will fail your MOT. Not everyone sticks to this however you will notice a difference in grip ratios – the same make and model of tyre will have the same grip ratio making your bike easier to handle and ride. Keep it simple, keep it the same. Fitting tyres to your bike isn’t easy, especially if you haven’t done it before and doing it wrong can severely affect the way your bike handles. As a rule, it’s probably best to get a professional to do the job for you however if you want to tackle it yourself you can but you will need to purchase lubricant, a bead breaker kit and a wheel balancer. Tyre pressure is important as it can have a massive impact on how your bike handles however the good news is that it’s easy to keep on top of. Tyre pressure gauges are cheap to buy and checking pressure is simple – you just remove the dust cap, fit the gauge and read the results. You then need to compare the pressure with the recommended tyre pressure as defined by your motorbike’s manufacturer, which should be in your owners’ manual. If your tyre pressure is too high, your tyres are obviously over-inflated and that can lead to a loss of grip. If your tyre pressure is too low, your tyres are under-inflated which means you will use more fuel, your tyres will wear quicker and you will notice poorer, heavier handling. The correct tyre pressure will not only provide more grip, it will also help your tyres last longer and improve handling. It is a legal requirement in the UK for tyre tread depth to be no less than 1.0mm around the circumference of the middle three quarters of the tyre. Once your tread depth reaches this limit, your tyres must be changed however it is advisable to switch your tyres before you reach that limit. Many organisations and companies advise changing at 2.5mm tread depth because at lower than this tread depth, you will notice a decline in your motorbike’s handling ability. Lower tread depth will also mean that your tyre is more susceptible to punctures and damage because it is worn. Tread depth can be measured using tread wear indicators on some tyres or tread depth gauges which can be bought and are easy to use. To use the shoe analogy again, if you bought a new pair of trainers you wouldn’t run a marathon in them straight away, you’d wear them in. The same goes for new tyres on your motorbike – you should run them in. This means you should ride for at least 100 miles and during that time you should not exceed 60mph and you should avoid sudden braking and changes in direction. It’s important that you’re familiar with your bike’s tyres. That means the way they look and how they handle. Check for any cracking, cuts or lumps and be aware of any change in performance as this could mean a problem. Then there’s tread depth, too. Keep on top of your tyres and react accordingly – they’re the only part of your motorbike that touch the road and you want it to stay that way.